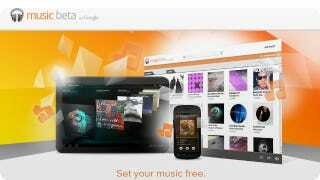 Google currently has an online music service, Music Beta, that serves as an online digital locker. You can upload your music library and access it remotely, but you can't purchase new music through the service. This limitation puts Google at a distinct disadvantage when compared to its competition. And there's a lot of competition. Services like Rdio and Spotify offer subscriptions that'll let you stream music across a variety of devices. iTunes will match your music and sync it through iCloud. And then there's Amazon's Cloud Music which lets you upload and stream your personal library. You can also add tracks by purchasing them from Amazon's Mp3 store, but there is no all-you-can-eat subscription.